...followed by the Maine School Garden Open House on September 24, 2016! Maine's annual harvest lunch week promotes fresh, local food in school cafeterias and teaches our children and youth where food comes from – including local farms, gardens and greenhouses. 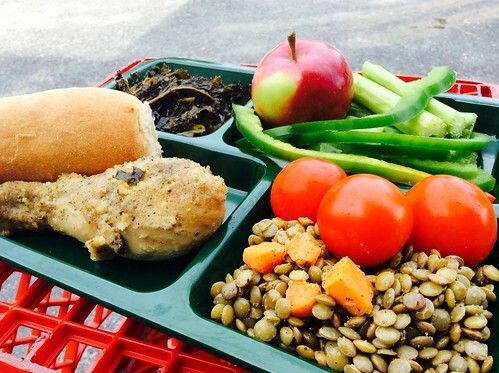 Maine schools have found creative ways to celebrate in the past, including decorating lunch rooms to showcase local food and inviting area farmers into the classroom to speak with students. Cost. Yes it may cost more. Keep in mind competitively shop when possible. Look at yields and quality of fresh product what are you throwing out on product purchased from your supplier and what are you saving on local products. This year you can give geographic preference in your purchasing. Trade off acknowledge producer advertise for them. Delivery. There have been several ideas on this issue. Bottom line; think out of the box, it is a community event. There is always the good old pick it up. Other options include district buses, district mail run, teachers that go between schools and volunteers. Quantity. Get what you can use what you have. You could do only one school at a time. Supplement local and other. Plan in advance and get the provider to agree ahead of time. The Maine Harvest Lunch was resurrected in School Year 2005 as a statewide event. It was dropped in the late 90s when budget cuts eliminated 50% of the state office Child Nutrition staff. Can a School buy locally and from a major supplier? Can a School use donations from local farmers or others? YES, and say "thank You" for the support to the food service program. People are surprised by how many small farms are in Maine. Look around, go to farmers market, or contact the Department of Agriculture. Does the farm need to be inspected? NO, inspection is not required. The school must know where the product came from, basically you should use common sense. Can I use the school garden even though it is unattended? YES commercial fields are not guarded no matter what size. Absolutely use the fresh product from the school gardens. What if I get only 50% of the product I need? Use what you can where you can. Will the product be in usable state? Maybe not. Small farmers may not have all the machinery needed to prepare and process products. It may take some skill and labor. The school may not have the staff to complete the task. Many schools recruited student and community volunteers to assist in Harvest Lunch preparations. What About the Classroom and Teaching Staff? Maine Agriculture in the Classroom has nice lesson called "Lunchtime Favorites" using a Venn Diagram that can be used for K - 12 with increasing complexity. It traces the source of foods to plant, animal or other (mineral, fungus, fermented products, yeast, etc.) that is available to teachers. For more information or questions about Maine Harvest Lunch Week please contact a child nutrition staff member.